Rocher du Coffre à mort et Pitons du Carbet au N.O. 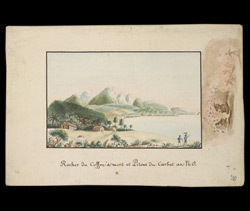 bl.uk > Online Gallery Home	> Online exhibitions	> Caribbean Views: the full collection	> Rocher du Coffre à mort et Pitons du Carbet au N.O. This sketch of the island of Martinique depicts the peaks of the Pitons du Carbet mountain range and the 'Rocher du Coffre a mort' which literally translates as the Rock of the Dead Man's Coffin. This unusually shaped rock can be seen to the right of the picture. The sketch is by Alexandre Moreau de Jonnès (1778-1870) an officer in the French navy. To the right of this sketch of the mountains is another sketch depicting a battle. A group of soldiers appear to be firing a canon to break down a wall.